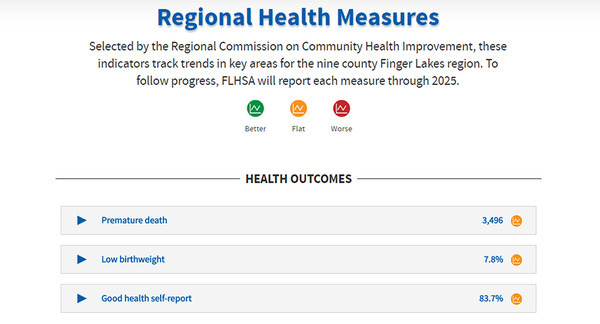 Get an overview of key health indicators on our Regional Health Measures webpage. Selected by the Regional Commission on Community Health Improvement, the measures cover health outcomes, such as premature death; community indicators, like childhood immunization; and clinical measures, including nursing home use. Color-coded icons and linked trend graphs indicate how the region is doing over time. Drop-down tables organize data by race/ethnicity, socioeconomic status and geography. The measures show recent changes such as a dramatic decline in preventable hospitalizations from 2010 to 2014 and a rise in emergency department visits with behavioral health diagnoses. Review all 16 measures here. FLHSA's Healthi Kids has won a $10,000 national award to combine literacy, physical activity and play into a story book walk outside Phillis Wheatley Community Library in the Southwest quadrant of Rochester. The award from KaBOOM! will bring to life the neighborhood’s favorite stories outside the walls of the library. Pages from a story will be mounted on wooden poles outside the library, and the story will change monthly to reflect the library’s programming. Youth from the library will create interactive sidewalks and write stories to bring books to life. For details, click here. The City of Rochester's 10-year-old lead-paint ordinance has attracted attention far beyond city limits. Yet few have achieved the level of success the city has had in implementing the ordinance, said Wade Norwood, chief strategy officer of FLHSA and a former city council member who sponsored the legislation. In the past decade, Rochester has inspected more than 141,000 rental units and there has been a more than 80-percent drop in the number of children reported lead poisoned. "Our city government has made a profound commitment to protecting our children, and that extraordinary effort has paid off," Norwood said. Read more. The Urban Wellness Summit brings together a national wellness speaker and presenters from two neighborhood health programs for two hours of inspiration and networking. The summit will take place from 8 to 10 a.m. Sept. 29 at the Maplewood YMCA. Learn more. Healthi Kids partnered with Cameron Community Ministries, Project Hope, Phillis Wheatley Community Library and Young Urban Preservationists Sept. 16 on Play ROCs PARK(ing) Day, an annual event that transforms underused spaces and vacant lots into vibrant intergenerational play spaces. 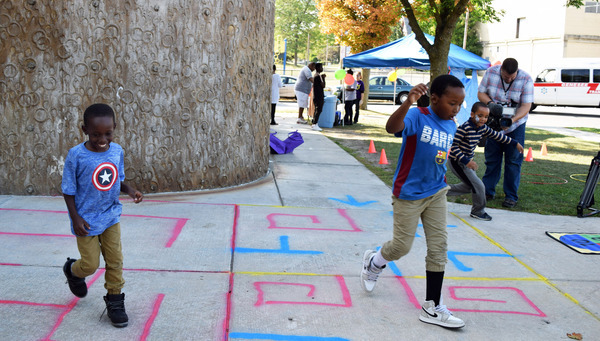 Here, 7-year-old Husseni Hassan and his brother, Abdi Hassan, 10, run through a maze on the sidewalk at the Phillis Wheatley Library in Rochester.